IT'S A FINE TIME FOR PODCAST 309!! 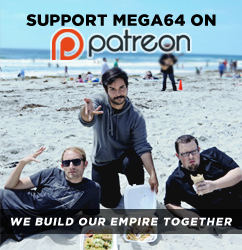 It is Tuesday, and that means another Mega64 Podcast for your digital consumption! This week, we have a very stripped down, RAW podcast. Join Rocco and Derrick at the 'Bucks for a brief show with minimal editing or fancy computer effects, chatting about recent stuff like E3, Game of Thrones, Battlestar Galactica, and Lucky Number Slevin (obviously). Watch it below on YouTube or download the audio version here. Stick with us- we're aiming to have a new video out tomorrow. Don't forget that we'll be appearing at all those summer cons soon, too- we have some big announcements for those VERY soon!